This clip set is a replacement clip set used on all 1956 Chevy Rocker Moldings. 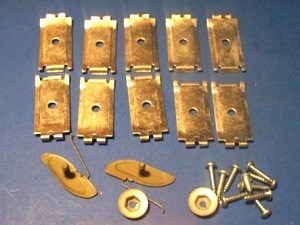 Similar to the 1953-1955 Chevy rocker molding clips set, listed elsewhere on this site, these clips are made to be held on with a sheet metal screws. This kit comes complete as pictured. I am referring to this clip set as a “replacement clip set” because these clips are held on with a sheet metal screw. The original rocker molding clips for 53-55 snapped into a square hole in the rocker panel. Those original GM clips are not being made today. These clips are made to replace the original snap in style, work fine and are made to be mounted between each of the orignal square holes.